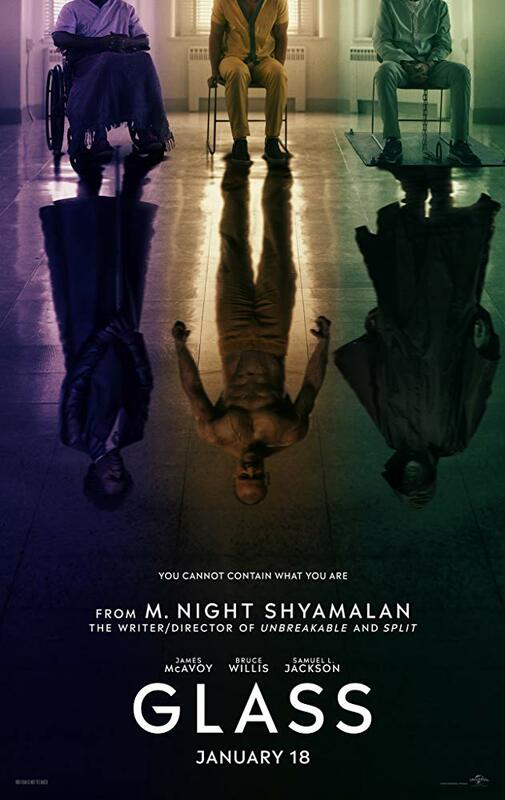 Nineteen years after Unbreakable and two years after the complementary surprise sister film Split, director M. Night Shyamalan delivers the long awaited wrap-up of his unconventional and innovative interpretation of a superhero movie. Glass delivers on its promise to tie the events and storyline of Unbreakable and Split together. The film starts off with David Dunn (Bruce Willis, Die Hard) uses his superhuman abilities to track down Kevin Wendell Crumb (James Mcavoy, X-Men franchise) who has gone on a spree of killings and kidnappings of young females in Philadelphia. The two adversaries soon find themselves captured during the climax of their confrontation and imprisoned at the Raven Hill Memorial Psychiatric Hospital by Dr. Ellie Staple (Sarah Paulson from American Horror Story). From there, the movie sets up an engaging atmosphere, challenging both the main characters and the audience to question the validity of their superhuman nature. Dr. Ellie Staple hopes to convince Dunn, Kevin and actor Sam L. Jackson’s,(The Hateful Eight), character Elijah Price that they suffer from a delusional disorder which they mistake as superhuman abilities. Mcavoy’s Kevin, who shifts between 24 different personalities, is significantly upgraded from his past performance in Split. This film allows Mcavoy to showcase more depth in his character and create a greater connection with the audience mainly by channeling the rivalry and tension between David and Kevin. Mcavoy’s first interaction with David, while minor at first, gives a huge preview as to the connection the two have. There isn’t much in the realm of soundtracks for this movie, which is attributed to Shyamalan’s style of directing that attempts to fully submerge the viewer into the story and its characters, which works great. The cinematography aides in this endeavor. The realistic filter highlights the environment around the main characters so as to make each scene revolve around them. Glass isn’t like a DC or Marvel movie when it comes to superheroes. There isn’t an epic fight scene that lays waste to a World War II base, and there aren’t any purple aliens with gold glove hunting magical stones around the galaxy. Glass humanizes the very idea of comic book heroes and villains. Shyamalan makes the notion of being a superhero a real world possibility to the audience. This movie is a great choice for anybody wanting a fresh take on the comic book cinema world. The main critique for Glass is the low amount of character development and screen time for Elijah despite his essential role in the plot. Overall, by the end of the film, viewers will be questioning their own abilities and whether or not they themselves are super. Have you seen Glass? Let us know what you thought in the comments below!